The Continental League was an idea proposed of an eight team baseball league throughout the united states and Canada. The continental league's goal was to join the MLB. However, the League never occurred and the idea was abandoned before the first game was even played. Although the idea was lost, the MLB expanded in response. The league was first proposed by William Shea the attorney of New York city. 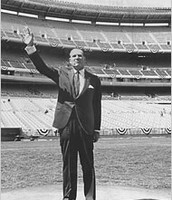 After the Brooklyn dodgers, and New York giants moved to California the city lost a significant amount of money. 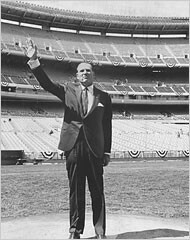 To get this money back, Shea proposed a new baseball league with a brand new franchise in New York to create the city more revenue. 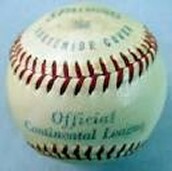 This an official continental league baseball. 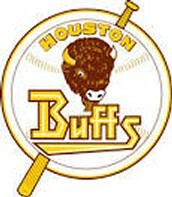 This is the logo of the Houston buffaloes who were a minor league team and would play for the continental league. This is William Shea the man who first proposed the continental league.